Make heading to the hospital when you’re in labor simple… Just grab it and go! Even if you’re planning a homebirth, I would highly recommend packing a hospital bag for birth. When I was transferred from home to hospital in my last birth, I was not thinking clearly AT ALL and could not pack! I’m so grateful my doula was there. She basically packed for me. 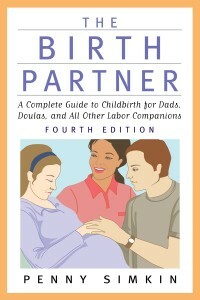 Things needed for BOTH labor AND postpartum have been marked with an *. Comfortable clothes to wear during labor like tanks, jersey skirts, etc. Toiletries – A Dental Travel Kit, Burt’s Bees Travel Kit and Burt’s Bees Lip Balm will be worth their weight in gold. Olive oil to put on baby’s bottom to make wiping away meconium poop fast and simple. Cute baby outfits including a “coming home outfit”. Choose outfits that have hats – hospitals can be chilly! Carseat (bring the instructions) – you can’t go home if you don’t have this! When planning for a hospital birth, it’s important to plan ahead and pack 2-3 different bags. What did you pack in your hospital bag? Would you add anything to this list? Would you take anything off? Leave a comment and let me know what you think. Great article! My eldest daughter is about to give birth soon, and I would definitely want to pack her a hospital bag. I like your tip in bringing a speaker to play music during labor. I’ll make sure we have that in her bag. Thanks for sharing! Great suggestions. I’m 37 weeks with my 2nd child and I’m actually packing more this second go around. I want to wear more of my own clothes and I was trying too hard not to go overboard last time.